Learn about your options for establishing workforce or employer assisted housing in our report. Job growth in small communities boosts the local economy, but inevitably puts new strain on the local housing market. Inadequate housing supply keeps Greater Minnesota businesses from growing to their full potential. A severe lack of housing often exists in areas where financing is unavailable. Greater Minnesota Housing Fund has researched these problems and created some programs in response. GMHF now offers two financing programs, a loan payment guarantee and mezzanine financing, to facilitate new development of workforce housing or employer assisted housing in such markets. These programs are described in GMHF’s report on Workforce Housing. 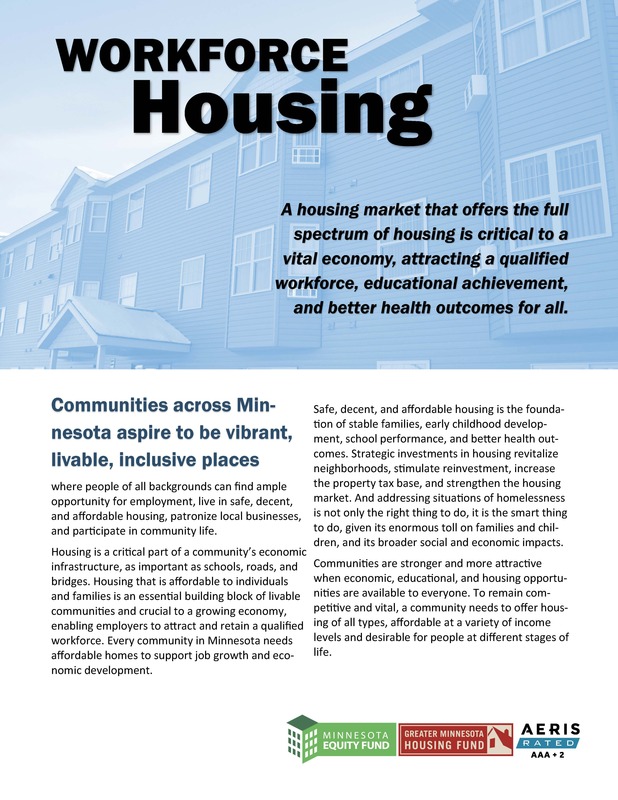 Download our report on creating Workforce Housing in Minnesota below. After reading the report, please reach out to us about the coaching and technical assistance we can provide you as you explore establishing your own employer assisted or workforce housing in Greater Minnesota.